In Service-Oriented MAS middle agents provide different kinds of matchmaking functionalities. If no adequate services are available for a specific request, a planning functionality can be used to build up composite services. In order to take advantage of recent advances in the field of AI planning for this purpose, we propose exploiting organisational information of Service-Oriented MAS to heuristically filter out those services that are probably irrelevant to the planning process. 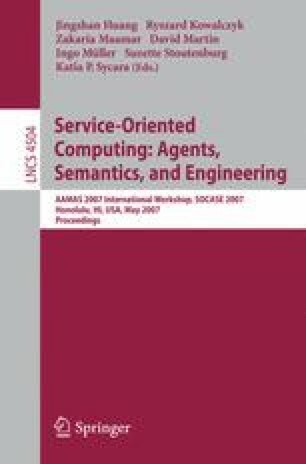 We present a novel framework for service-class based filtering and show how it can be instantiated to a particular MAS domain based on role and interaction ontologies.